The Darrang district of Assam has hit the headlines for the wrong reasons even as the infamous Dokmoka mob lynching which jolted the state and nation on June 8 last is still fresh in everybody’s memories. In yet another gruesome incident of moral policing and mob violence, an innocent youth was mercilessly assaulted by a group near Adarsha village under Kalaigaon police station in Darrang. 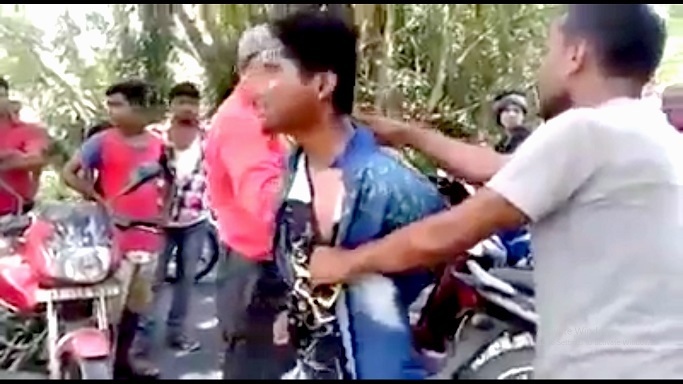 The video which has gone viral in several social media platforms shows the unruly people allegedly led by one Pankaj Hazarika tying the hands of the youth and savagely assaulting him identifed as one Bijay Ray(23). The youth is seen pleading innocent and asking repeatedly what mistake did he commit. He screams in pain while another kicks him in the legs and shoulder as he slumps to the ground. The victim youth, son of Habul Chandra Ray, a resident of Gauripur town, Ward No 1 under Gauripur police station in Dhubri district works for cellular tower companies and had travelled for work purposes to Bishnupur village under Mangaldai police station in Darrang. The police said that incident took place on June 9 when the victim Bijay was on way to Adarasha village under the limits of Kalaigaon police station area in Darrang and was surrounded and beaten up by the group. The victim youth stated that on receiving a phone call of a girl whom he had known in past visited the village to meet her. They didn’t stop there, a voice from the mob asks the youth if he is a Bangladeshi, whether or not his name included in draft NRC. Meanwhile, the Udalguri district AKRSU led by its president and secretary, Hemanta Bora Koch and Nabajit Koch respectively along with Secretary of Consortium of Koch Royal Families (CONKORF), Pranab Narayan Dev Koch have lodged two separate FIRs in this regard. The organizations have demanded proper investigation of the matter and arrest of the culprits involved at the earliest. The Superintendent of Police (SP) of Darrang, Sreejith T, IPS told NorthEast Now that the FIRs of CONKORF and AKRSU have been clubbed and registered under relevant sections and police is on lookout for the accused. He further informed that the victim and the accused both reported the incident at Mangaldai police station on the aforesaid day of June 9 and gave it in writing that a scuffle had taken place and they don’t intend to proceed further. The Mangaldai Police later left the youth in personal recognition bond after medical treatment, the report of which is yet to be obtained.